You can’t say I never show my kids a good time. 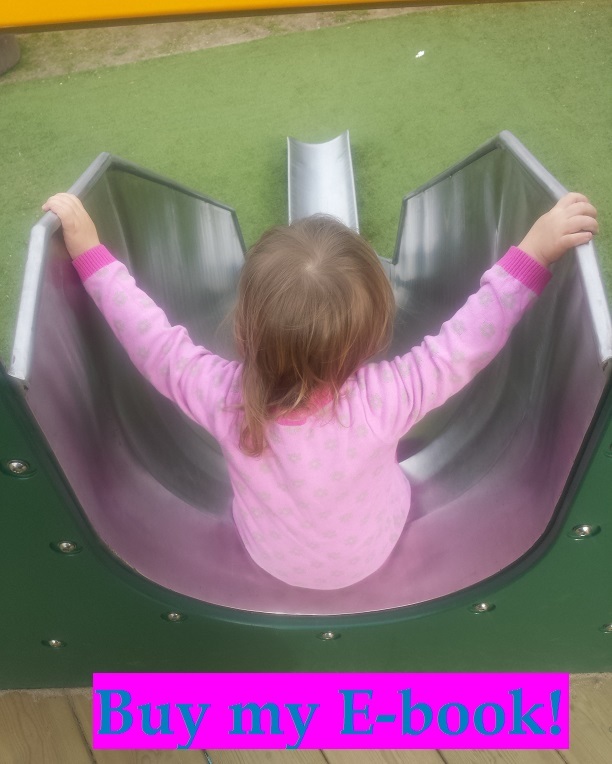 This week we’ve been to the cinema to watch a DVD, the cinema again (Eva only) to watch one of the worst movies ever and to various playgroups and cafes. Last night, to make a change, I went to the cinema all by myself to watch a slightly better film. So, how to top such an exciting week? Why, with a drive down the Old Kent Road of course! Roo had Christmas money to spend. Technically so did Eva, but her actual tenner had been spent before Christmas when her mother legged it to the pub on a very rare evening out. I’ll pay her back when I find something she yknow…needs. It’s not like she has any idea what’s going on. Roo, on the other hand, has been jealously guarding his money box ever since Christmas just in case I raided that for gin-money as well. I didn’t. In fact, I supplemented it with a few grubby pound coins that a builder gave me for nicking some of our electric. 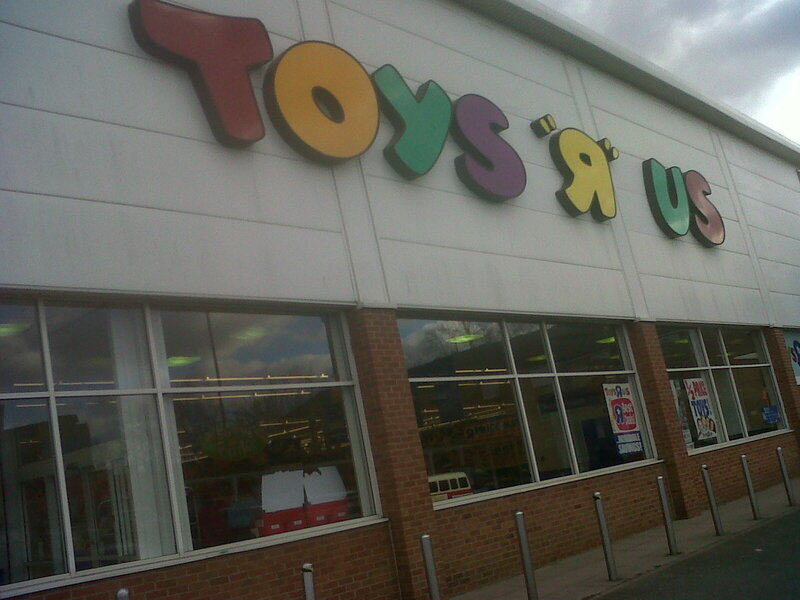 So Roo had a princely £17 to spend and a destination – Toys R Us. To say he was excited might be a bit of an understatement. As soon as he was released from the car, he tried to run towards this warehouse of fun. Running in a car park is a Bad Idea, isn’t it boys and girls? Daddy certainly thinks so, so there was a small disagreement before anyone even set foot in the toy shop. This was going to go well. Luckily, it was out of order so we could legitimately say that it wouldn’t take our money. Shame! Don’t worry, he was back on track pretty quickly, racing from shelf to shelf burbling “I don’t want zis game, I want zis horsie or zis toy. I want zis one too!”. 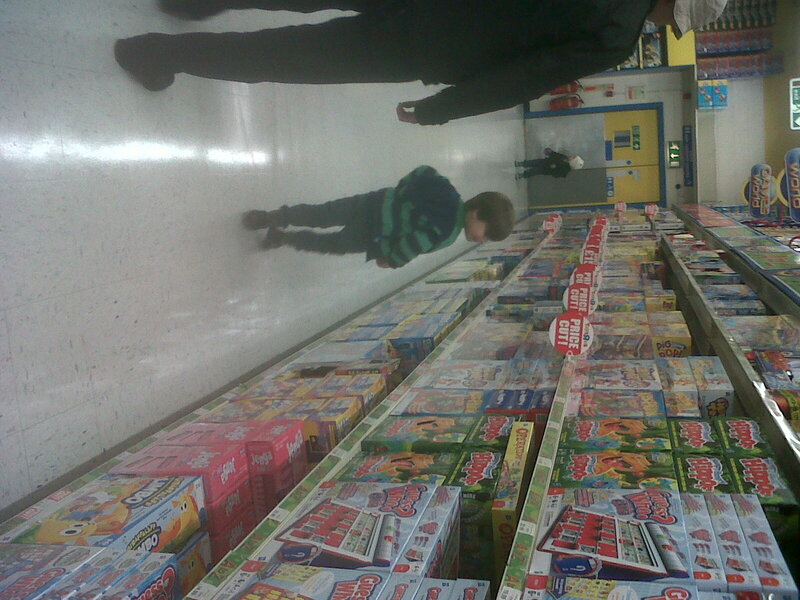 He was like the proverbial child in the toy shop. He picked up the hobby horse and cantered around on it a bit. 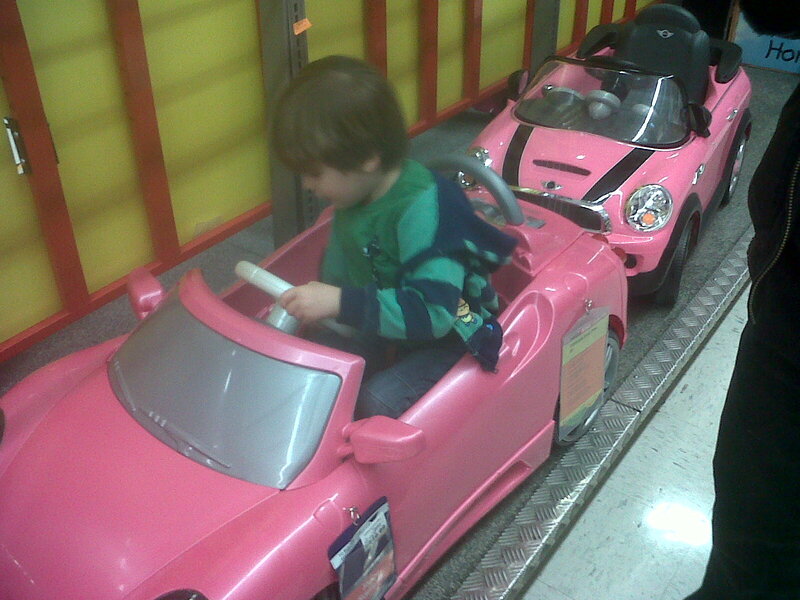 He climbed into the toy cars. And, almost inevitably, we lost him once or twice. 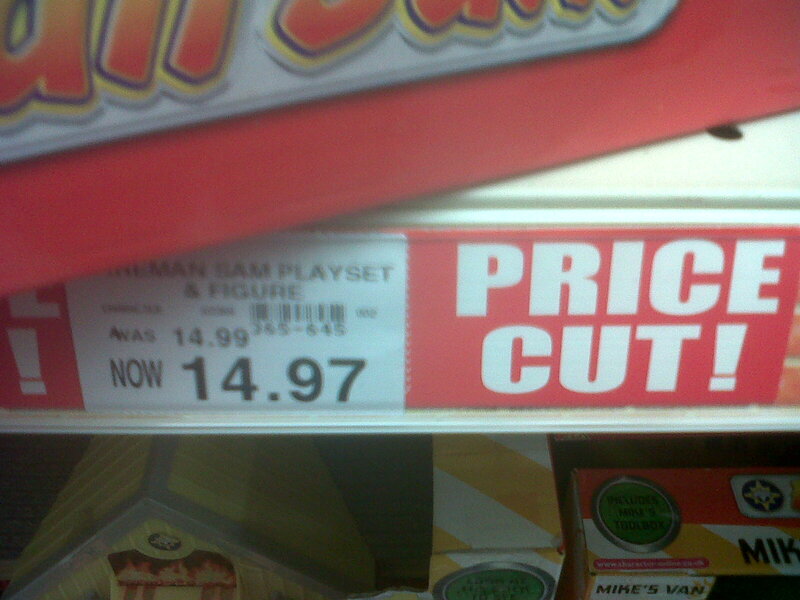 Price Cut! From £14.99 to just £14.97! We just had to have it. 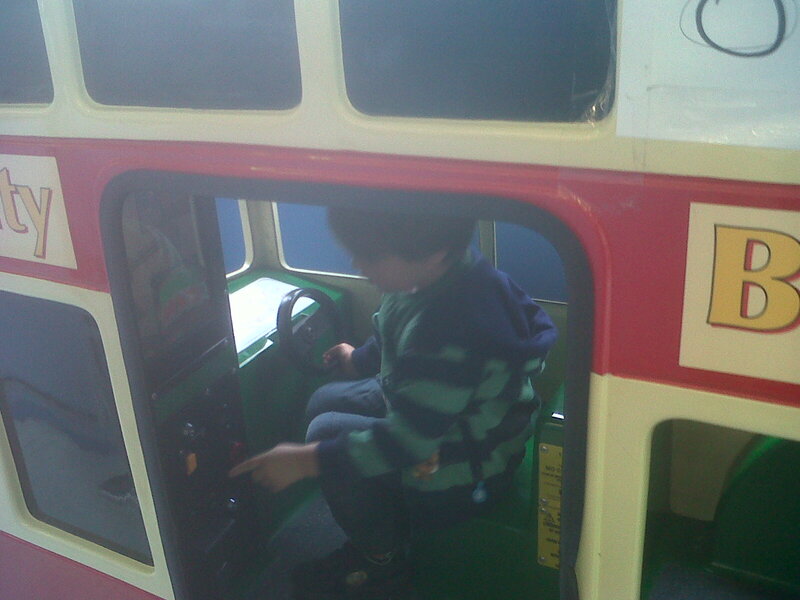 The fire station would also go with the Fireman Sam toys he already had, so we gently steered him towards it. It was a sensible idea. No, he didn’t need a Disney train aged 6-18mths. Or a Chuggington roundhouse that wouldn’t fit his existing Chuggington toys. Fireman Sam fire station it was! With shopping complete, we had some time to kill before visiting friends. So we went to Sainsburys in New Cross. You know I love a supermarket. 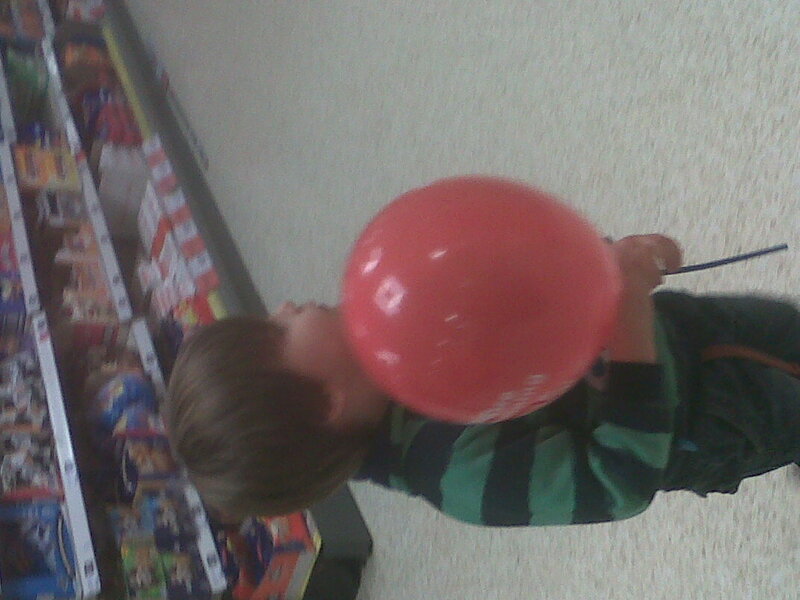 On the way in, Roo got given a balloon which made him happy and then he ran around like a loon while me and Eva did the shopping. At one point, Nathan yelled down an aisle “tell you what – I’ll chase him and you do the shopping” Err, wasn’t that what we were doing already? Was I meant to be chasing him too? Oops, sorry! 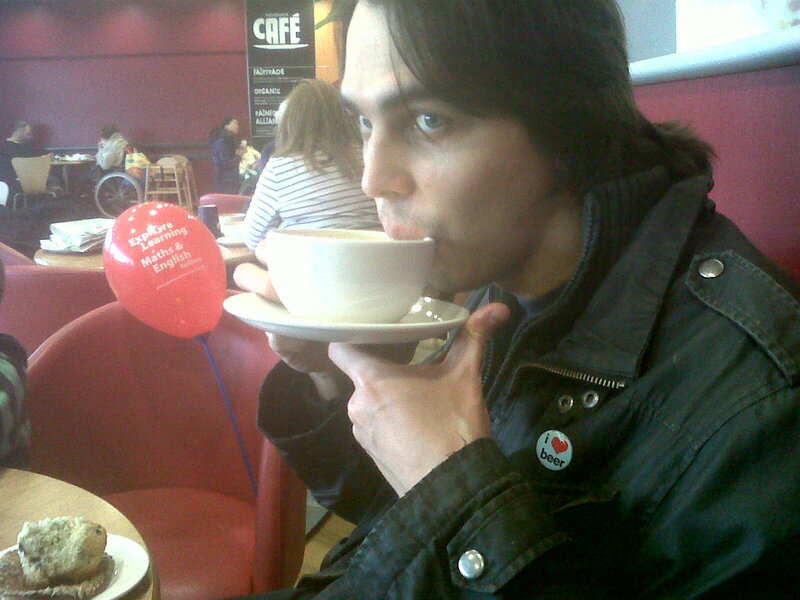 Then we went to the cafe for coffee/juice/muffins (delete as applicable). 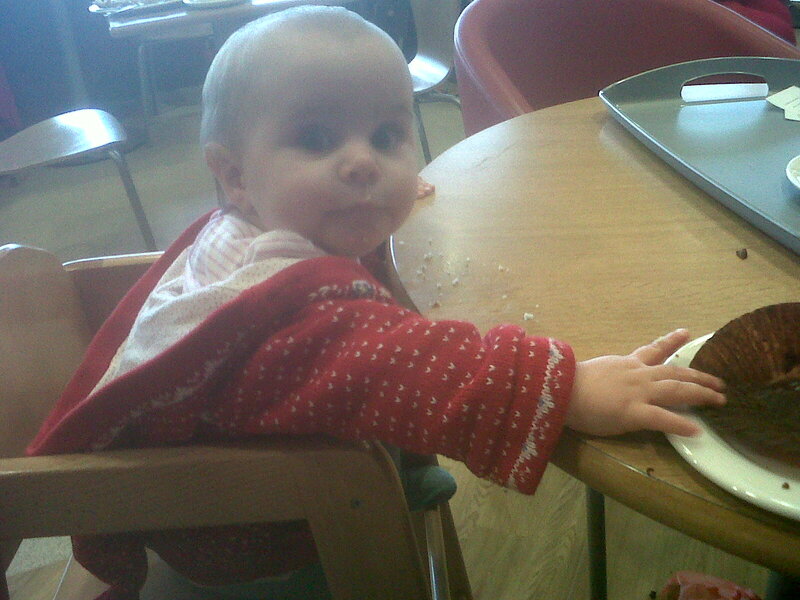 Roo demolished his chocolate muffin, and Eva tried to steal mine. No such luck lady! It’s just out of reach. Then Roo started to get a bit melty-downy. He’d already said he wanted “two adventures, not three” and our friends had texted to say they were stuck in Peckham so it was probably time to go home. Having asked for home several times, Reuben changed his mind just outside the store during another argument with Nathan about the dos and don’ts of being in a car park. Given the choice of walking nicely back to the car or staying outside New Cross Sainsburys forever, Reuben chose the latter. “I want to stay right here forever”. Annoying as he was being, it was quite amusing to picture our little boy spending the rest of his life standing in a supermarket car park in New Cross. Wonder if he really is stubborn enough to do that? I reckon so. This entry was posted in Creating precious childhood memories or something (days out) and tagged shopping, South London, toys. Bookmark the permalink. Ha ha I literally had to drag Austin out of that bus the last time we visited TrU!